Natalie Potter, 90, of Vesta, passed away on Monday, August 06, 2018 at the Parkview Home in Belview. Funeral services are 11:00 AM on Thursday, August 9, 2018 at St. John’s Lutheran Church in Vesta. Visitation will be from 5 – 7 PM on Wednesday at the church and will continue one hour prior to the service at the church on Thursday. Interment is in the Vesta Cemetery. The Sunset Funeral & Cremation Association is caring for the family. Natalie Marie Potter was born on February 22, 1928 to Walter and Marie (Boetcher) Voss in Echo Minnesota, Yellow Medicine County. She was baptized and confirmed at Peace Lutheran Church in Echo and graduated from Echo High School in 1945. After graduation, she attended one year of college at Mankato State University. On November 23, 1947, Natalie was united in marriage to Lee Potter at Peace Lutheran Church in Echo. They lived on a farm near Wabasso until moving to a farm near Vesta in 1952. In 1964, Natalie began working as a nurse’s aide at the Parkview Home in Belview and after 7 years she passed her LPN exam and continued nursing for over 39 years. In 1991, Lee and Natalie left the farm and moved into Vesta. Natalie was an organist at St. Paul’s Lutheran Church in Seaforth for many years, and active with the American Legion Ladies’ Auxiliary, Ladies Guild and the Parkview Auxiliary. In March of 2018, Natalie became a resident of the Parkview Home in Belview. 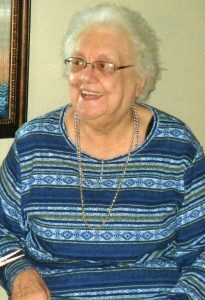 She enjoyed bowling, crafting, scrapbooking, writing poetry, playing cards, traveling by RV to many bluegrass festivals, spending many winters in Arizona and loved time with her family, grandchildren, great grandchildren and many friends. On Monday, August 6, 2018, Natalie passed away at the Parkview Home in Belview at the age of 90. She is survived by her children, Susan (Howard) Breitkreutz of Alexandria, Bruce (Mary) Potter of Echo and Kathleen (Brian) Williams of Montevideo; 13 grandchildren, 20 great grandchildren; one sister Lorna Schmidt of Willmar; and many nieces, nephews, cousins and friends. She was preceded in death by her parents, husband Lee, and son Arnold Potter.